Tuesday July 2nd 1895 I got my work done nicely and a good dinner ready by noon. The young folks came from Stevens. Joe and Will were down town in the forenoon. Joe went away in the afternoon. We had a pleasant visit. Wednesday July 3rd 1895 I did baking for tomorrow this forenoon and got the ironing done. Will and I went down town after dinner. did not stay long as it was the first time we had even taken Belle from the colt. I did the evening work after coming home. It is getting warm again. 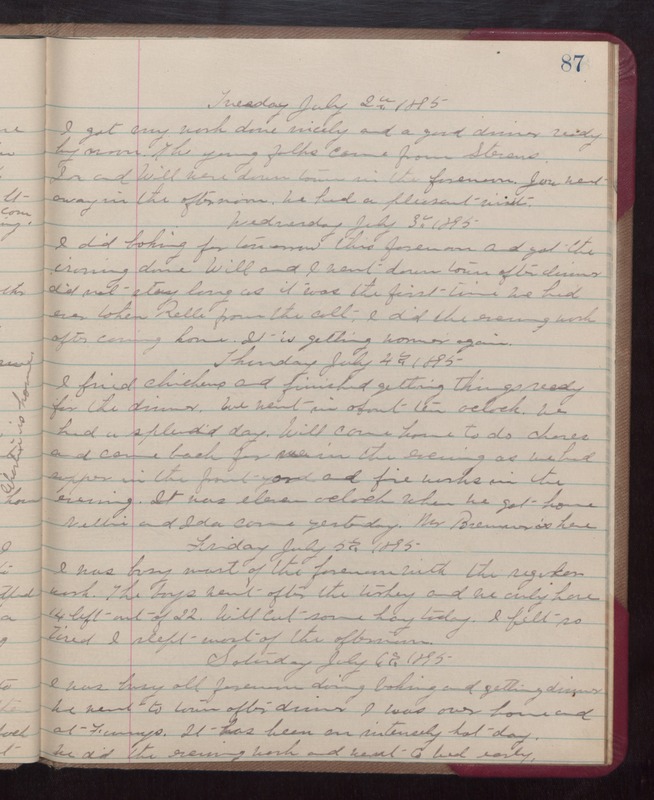 Thursday July 4th 1895 I fried chickens and finished getting things ready for the dinner. We went in about ten oclock. We had a splendid day. Will came home to do chores and came back for me in the evening as we had supper in the front yard and fire works in the evening. It was eleven oclock when we got home Nellie and Ida came yesterday. Mrs Brewer is here. Friday July 5th 1895 I was busy most of the forenoon with the regular work. The boys went after the turkey and we only have 14 left out of 22. Will cut some hay today. I felt so tired I slept most of the afternoon. Saturday July 6th 1895 I was busy all forenoon doing baking and getting dinner. We went to town after dinner. I was over home and at Fanny's. It has been an intensely hot day. We did the evening work and went to bed early.